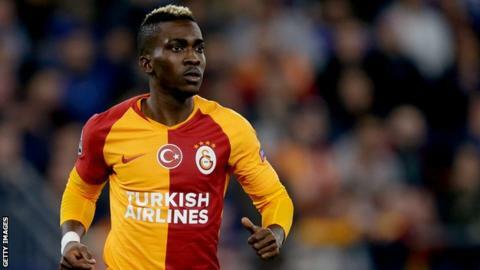 Nigeria have been forced to call up Henry Onyekuru to replace injured striker Odion Ighalo for the Africa Cup of Nations qualifier in South Africa. The 29-year-old picked up a hamstring injury in Wednesday's Chinese Super League 2-2 draw between his Changchun Yatai side and Tianjin Quanjian. Ighalo is the top scorer in Nations Cup qualifying with six goals including five in two games against Libya. Nigeria face South Africa in Johannesburg on 17 November and host Uganda three days later. Onyekuru, 21, has scored twice in 12 appearances this season for Turkish club Galatasaray, where he is on loan from English side Everton. It comes as the latest setback to the three-time African champions who have lost Wilfred Ndidi through suspension, and injuries to Ogenyi Onazi and goalkeeper Francis Uzoho. Nigeria top Group E with nine points from four matches, a point ahead of second-placed South Africa. The three-time African champions will seal qualification to next year's tournament in Cameroon if they beat South Africa.